International leaders have been working together for the last 11 months on those issues that concern as all: namely why are we as a society not doing better? 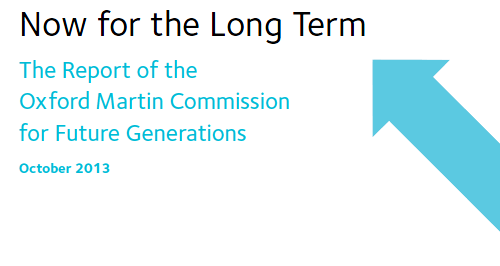 In the report “Now for the Long Term”, the Oxford Martin Commission for Future Generations, gives a sobering overview of what challenges we are confronted with and how we as a society can do better and create a resilient, inclusive and sustainable future for all. It calls for a radical change in politics and business to deliver progress on climate change, reduce economic inequality, improve corporate practices and address the chronic burden of disease. Download the Now for the Long Term report, Oxford Martin Commission, University of Oxford, and follow the debate on Twitter with the hashtag #longtermnow.